Hay Hay It’s Donna Day: Terrines! As you know from my post yesterday, I’ve been a little under the weather the past few days. Therefore, there has been lots of mindless surfing of the Internet and, more specifically, food blogs. One of the ones I go to quite frequently is So Good Blog. It’s chock-full of random tidbits, nibbles, and bites about the world of food. Often times, it’s very much like a bus full of carnies – it scares the crap out of me to look at it but i stare anyway. Of all of the posts I’ve seen on SoGoodBlog, this one takes the cake…or the pie, as it were. 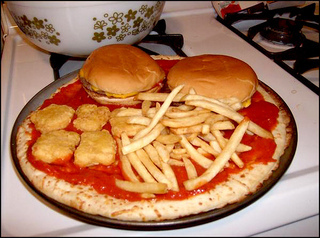 Originally found on andiamnotlying.com, this McDonald’s-infused culinary wonder stopped me in my tracks. I am going to blame my morbid fascination on the Mucinex-induced haze or the fact that I’m jacked up on about 5,000% of my daily recommended dosage of Vitamin C. In any case, I wanted to share this with those who may have not had the good fortune to come across these photos as they traveled the Internet. Please make sure you see the last photo of this delicious dish for some inspired plating and food styling techniques! OMG! So wrong! So deelishussss! I’m almost tempted to make one. Though, instead of a gun and knife; I would rather have a crash cart for the impending heart attack. This is hilarious! Thanks for the fun link – I’m definitely going to check out. Unbelievable!!! I know pizza with fries or shoarma, but with an entire hamburger on it!!! Hilarious! Make sure you look at page 2…oh nastiness! that looks awesome. i eat those things separately but together? hmm.. not so sure!